It is with great sadness that I have to announce to you that Bob Bennewitz passed away Tuesday morning (3/13). Bob was an integral part in the founding and growth of Atlanta Fire United. Bob started building AFU, then called West Gwinnett Soccer, in 1989. His endless dedication to AFU included many hours of work while holding positions such as AFU Board Chairman, President, Board Member, Director of Scheduling, AFU Soccer Coach, and most recently Board Member for the City of Duluth Parks and Recreation Department. Bob loved AFU soccer but most importantly he loved coaching and helping the kids. He knew it was all about the kids. On a personal note, Bob Bennewitz was one of the best men that I have ever had the privilege of knowing. He was that person that everyone loved and if you knew him you looked up to him. 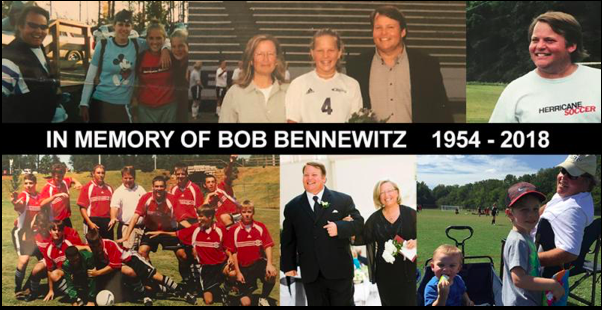 The AFU Bob Bennewitz Foundation has been created in his memory.